I was challenged a couple of decades ago while attending a worship leadership conference to make a list of individuals who had intentionally taken the time to encourage me in my early ministry years. The clinician gave us time to complete our list and then asked, “Have you told those individuals how much you value that investment?” After returning home from the conference I drafted half a dozen thank you notes to send to those mentors I had listed. Paul Williams was on that list. Nearly four decades ago I began my first full-time ministry position. Paul Williams served as a music and worship pastor in another church in our city. In my first week or two of ministry he stopped by my office and didn’t ask, but told me he was going to pick me up the following Saturday to attend a music workshop with him. This wizened sage of music and worship ministry (he was probably 40) invested in a 24-year-old worship beginner not for what he could get from me, but what he could offer to me. My first ministry position was one of those learning experiences that many of us have endured in ministry. Paul knew the history of our congregation and the challenges I would face way before I figured it out. He never offered a lot of useless advice or platitudes when I was struggling to stay or questioning whether I missed God’s calling. He just became a friend who graciously listened, encouraged and was available every time I needed his wisdom. Before Paul died in 2010 from complications of Acute Myelocytic Leukemia, he had served as Music and Worship Pastor for 35 years and then in 1992 began serving full-time as a lyricist, clinician and composer. Even though I moved to a different state, Paul continued to send me packets of his new music every few months with a humorous personal note of encouragement and a loving note to my family. I’m sure others received similar packets and notes from Paul since my relationship with him was not unique. He just had the ability to make each person feel that way. I’m not certain I’d still be in ministry today if Paul Williams hadn’t taken the time to help shape me then. 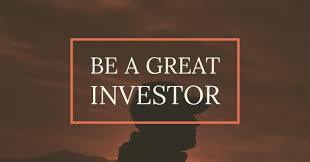 Investing in others means we make deposits of our time and talents so the return will be compounded for future withdrawals. Our success in worship ministry will not be judged just on how well we did it ourselves, but on how well we helped others do it too. So if we want great worship leaders to replace us in the future, then like my friend Paul we must invest in those not yet great worship leaders in the present. Continuous worship is always easier when things are going our way. So it’s easy to worship when you have a job, a healthy family, a lovely home and financial security. But what about when the daily events of life threaten to consume you? 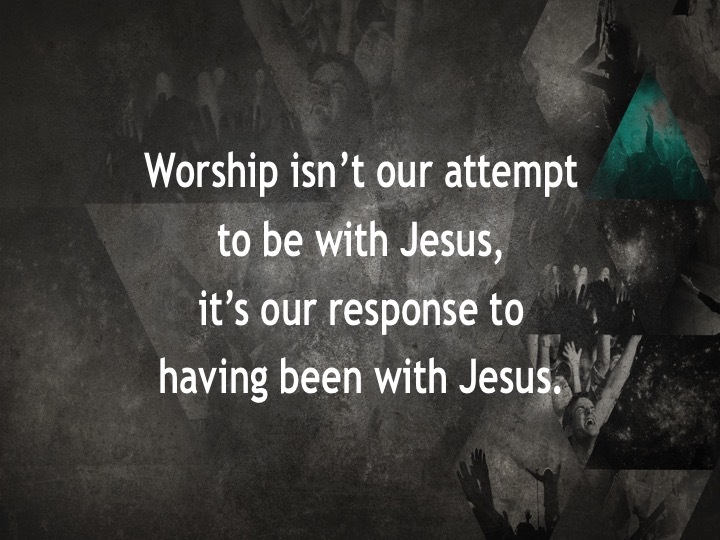 If worship is continuous, why wouldn’t you also worship then? 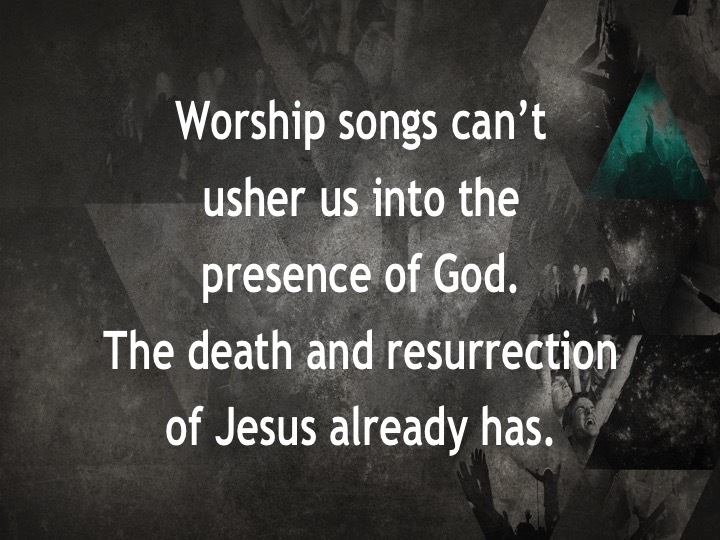 Worship is our response to whom God is, what he has done and what he continues to do. His revelation is perpetual, meaning it doesn’t start and stop according to the various circumstances of life; therefore, our responses shouldn’t either. Even when the Sunday hymns, songs and sermons fall short with clichéd platitudes, why wouldn’t you worship? Even when it seems like everyone else is better off than you are, why wouldn’t you worship? Even when complaint or anger is the only response you can come up with, why wouldn’t you worship? 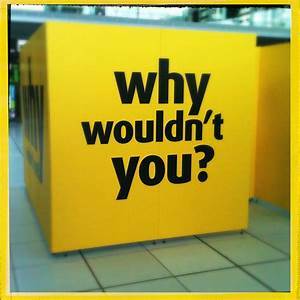 Even when “why?” and “how long?” are the only things you can ask, why wouldn’t you worship? Even when your family is incomplete because of infertility and miscarriage, why wouldn’t you worship? Even when job loss, a broken marriage or health stress causes you to doubt God’s provision, why wouldn’t you worship? Even when depression or anxiety overwhelms you, why wouldn’t you worship? Admitting to God that you can’t do these things on your own is in itself a profound act of worship. And worship that never addresses these issues is dishonest. 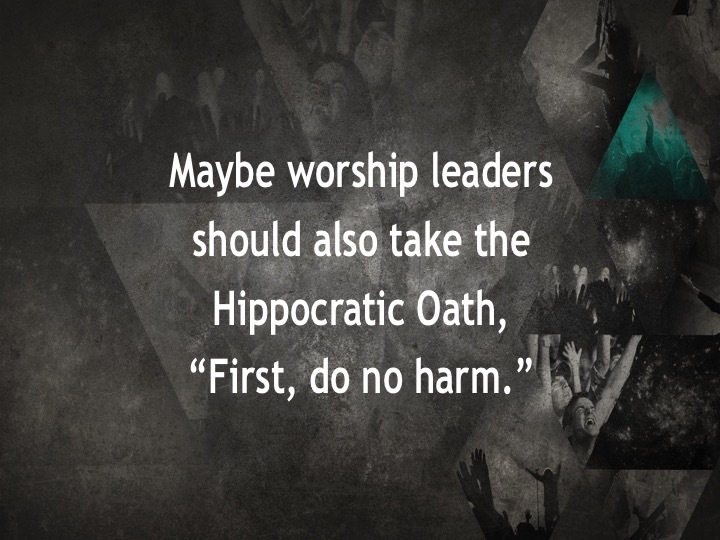 If God expects that kind of worship and is not threatened by it, then neither should we be. So even when offering your worst is all you have left, why wouldn’t you worship? Remember to take courage in the assurance that He Is Able to do above and beyond all that you ask or think according to the power that works in you (Eph. 3:20). When no generation is ever really happy musically…He is able. When your ministry shelf life is moving toward the expiration date because you are no longer young enough or trim enough…He is able. When you are always a step behind musically, technologically and culturally…He is able. When you are tempted to quit every Monday morning…He is able. When you wish you served someplace, anyplace else…He is able. When you are always the first one to arrive and last one to leave…He is able. When no amount of rehearsal can make your group presentable…He is able. When staff collaboration actually means silent obedience…He is able. When needed change is never well received…He is able. When you feel like no one is holding your rope as you start to slip…He is able. When date night with your spouse is the worship team potluck…He is able. When you feel like you are missing out on your children’s lives…He is able. When you have been terminated for any or no reason…He is able. When your creativity has been exhausted and burnout is causing you to coast…He is able. When you don’t have the resolve to take care of yourself spiritually, physically and emotionally…He is able. “Now to Him who is able to keep you from stumbling, and to make you stand in the presence of His glory blameless with great joy, to the only God our Savior, through Jesus Christ our Lord, be glory, majesty, dominion and authority, before all time and now and forever. Amen” (Jude 1:24-25). Several years ago, the website CNN Money posted a story titled: Stressful Jobs that Pay Badly. The article listed fifteen of the most overworked and underpaid professions. Number 5 on the list…Music Ministry Director. The stress level of this position was only surpassed by jobs such as social worker and probation/parole officer. Worship leaders live under a tremendous pressure to perform. The demands and stress of the position can lead to relational conflict, burnout, family crisis and even forced termination. 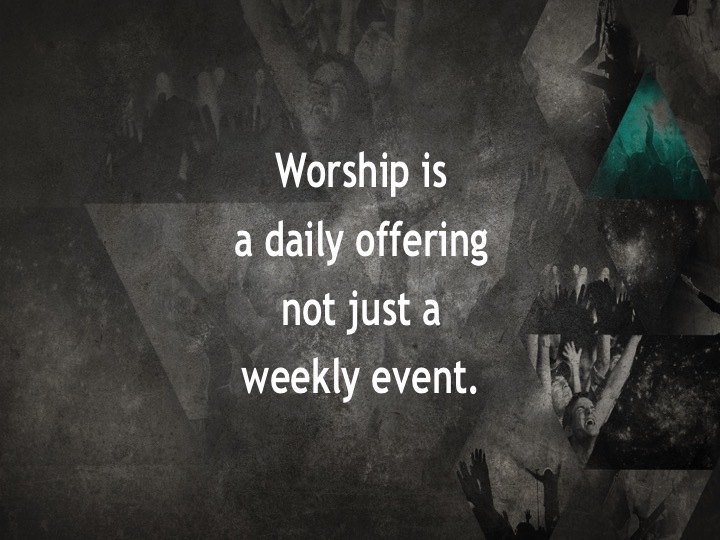 At one time or another (or perhaps every Monday morning) all of us have asked the question…Is worship leading really worth it or should I consider doing something or anything else? 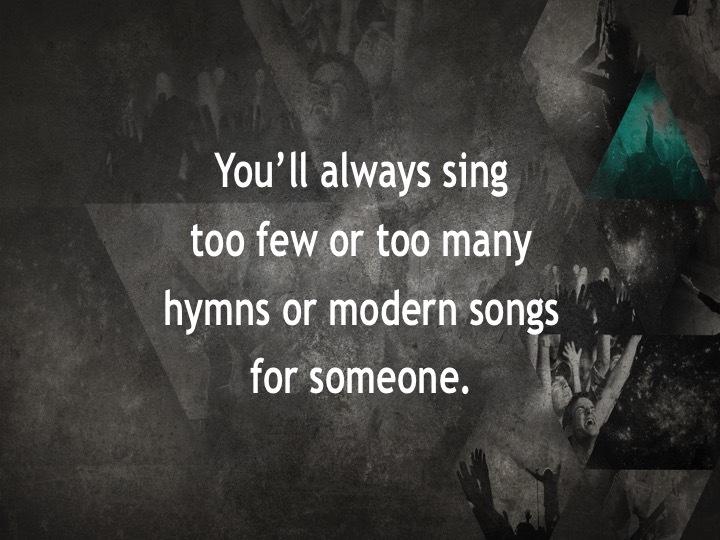 When you’ll always sing too many or too few hymns or modern worship songs for someone? When the only time available for family vacation is after the student choir mission trip, VBS and camps but before the fall ministry kick-off? When you worry if your children will even like church when they are no longer required to attend? When the Christmas season can’t begin for your family until after multiple programs and the Christmas Eve service? When congregants upset with you take it out on your spouse and children? 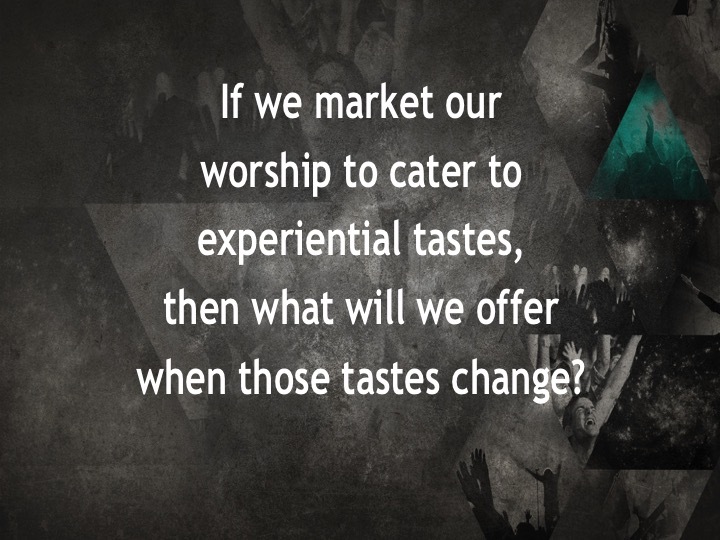 When worship conversations circle around what people want, deserve, prefer or have earned? When one generation discovers that loving another generation more than they love their own musical preferences is an act of worship. When the troubled teen that got involved in your student choir now serves as a worship leader. When your grown children are faithfully serving in ministries and missions. When Christmas programs break through those spiritual barriers like no previous services have. When congregants realize that how they treat their leaders is also an act of worship. 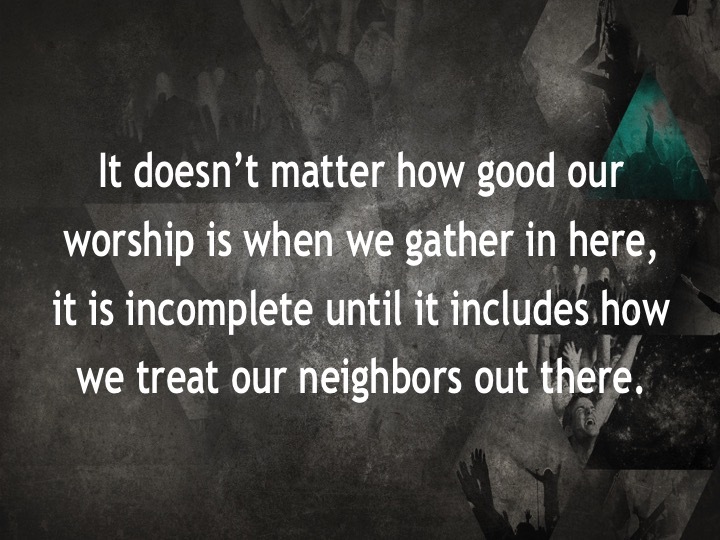 When worship conversations circle around what God wants, deserves, prefers and has earned. Cause and Effect is a relationship in which a person, action or thing makes another thing, action or event occur. A cause must always precede an effect in order for that effect to occur. So the effect is then a consequence of the cause. God’s revelation (cause) is when He offers us a glimpse of His activity, His will, His attributes, His judgment, His discipline, His comfort, His hope and His promises. Our response (effect) is the sometimes spontaneous and sometimes premeditated reply to that revelation…worship. A model for this cause and effect worship understanding is found in Isaiah 6:1-8. The holiness of God is revealed (cause) to the prophet Isaiah and his natural worship response is contrition (effect), “Woe is me, for I am ruined” (Isaiah 6:5). God revealed his mercy (cause) and Isaiah’s worship response is service (effect), “Here am I. Send me” (Isaiah 6:8). If our worship responses are the effect, then it is not possible for those worship actions to also be the cause. What we sing or how we sing it can’t cause a response because it is the response. The cause…God’s revelation can’t be generated by the effect since the effect is a response to the cause. So as good as our various worship actions are, they still can’t cause worship to occur because those worship actions are the effect. Our worship actions may prompt, remind, exhort, prod or encourage more effect but they can’t cause cause. We can acknowledge the cause but we can’t generate it. We can respond to the cause but we can’t initiate it. We can celebrate the cause but we can’t create it. 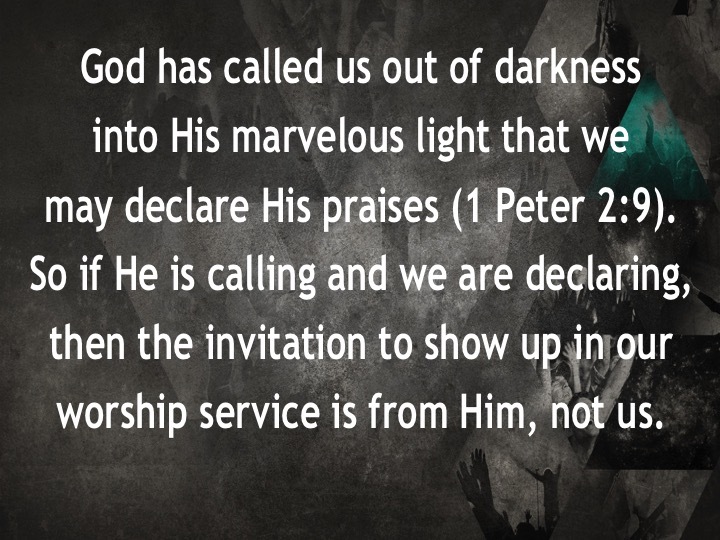 He has called us (cause) out of darkness into His marvelous light that we may declare (effect) His praises (1 Peter 2:9). The Father is seeking (cause) the kind of worshipers who worship (effect) in spirit and truth (John 4:23). God Causes…We Effect. Worship is our response to the overtures of love from the heart of the Father. It is kindled within us only when the Spirit of God touches our human spirit. Forms and rituals do not produce (cause) worship, nor does the disuse of forms and rituals. We can use all the right methods (effect), we can have the best possible liturgy (effect), but we have not worshiped the Lord until His Spirit (cause) touches our spirit. Adapted from Richard Foster, Celebration of Discipline (San Francisco: HarperCollins, 1978). 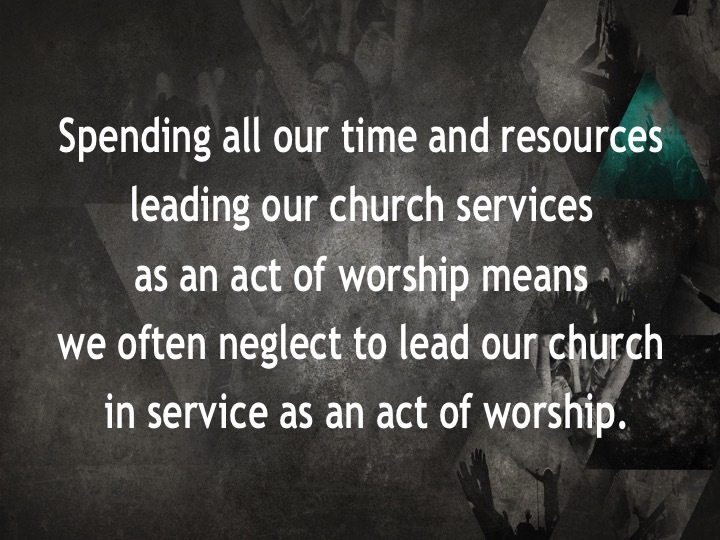 Spending all our time and resources leading church services as an act of worship means we often neglect to lead our church in service as an act of worship. If our entire focus is on getting them to worship here, then we have nothing left to send them out to worship there. Serving others is the action we take to ensure the songs we sing when we gather are embodied when we scatter. Serving as an act of worship means we are so awakened by God’s purpose in the world that we can’t wait for the worship service to end so we can actually get out there to share it. This awareness means our singing is no longer focused just on consuming as we gather but offering as we disperse. Worship as service is often messy and not always comfortable since it can’t be contained in one location, context, culture, artistic expression or vehicle of communication. But worship comfort is not a biblical concept. Worshiping here and worshiping there are both biblical and necessary if we are to faithfully respond to Jesus’ command to love God and love others. One can’t survive without the other. It doesn’t matter how good our worship songs and actions are in here, they are incomplete until they also impact how we serve out there. So we can’t just draw the blinds during the week and wait for the next Sunday if we want to respond to the work God is actually doing. Mark Labberton, The Dangerous Act of Worship: Living God’s Call to Justice (Downers Grove: InterVarsity, 2007), 13. Eugene H. Peterson, Christ Plays in Ten Thousand Places: A Conversation in Spiritual Theology (Grand Rapids: Eerdmans, 2005), 71. Steeplejacking is a coined term that describes the attempt to infiltrate, influence and take-over an existing congregation. In the corporate world steeplejacking could be compared to a hostile takeover. It is often initiated by marginalizing what a congregation has done or is presently doing in order to coerce it into making radical changes. It is irrefutable that adjustments to worship practices are often necessary as a church considers the cultures and contexts of those present and those not present yet. But in an effort to initiate some of those changes, leaders sometimes push to do anything different than what is being done presently. The consequence is those who have been around for a while feel as if they are losing the church they have known and loved. So even when change motives are pure, it still seems like their church is being steeplejacked. Many of those congregational veterans are probably not that averse to all worship change but are just feeling sidelined as those changes are being considered without them. It seems to them that their opinions are no longer considered and their convictions are overlooked as antiquated. So their decades of blood, sweat, tears and tithes are facing foreclosure and eviction. A revolution forcibly overthrows an existing system or structure in order to substitute another. It replaces what presently exists without considering what might still hold value. And in a revolution one side always loses. A reevaluation, however, examines something again. Reevaluation allows a congregation to consider change by rethinking, revisiting and reinvestigating. It systematically and selectively preserves valuable elements for re-use. Prayerfully adding to existing worship practices instead of arbitrarily taking them away could allow churches to initiate needed changes without the unnecessary pain of steeplejacking. Then it’s possible those changes would be approached by all as an opportunity instead of a threat or a cause for celebration instead of a reason to despair. Heath, Chip and Dan Heath, Switch: How to Change Things When Change Is Hard (New York: Broadway Books, 2010), 55. Karaoke singers are provided with a microphone, sound system and projected text for the purpose of imitating a familiar song originally recorded by a popular artist. They are even judged on how well (or poorly) they imitate the original artist and his or her songs. Karaoke happens in our worship services too when we imitate the worship habits, methods, styles and even attire of other artists or congregations without considering our own gifts and calling or the calling and abilities of our players, singers and congregants. Obviously, not all congregations are gifted with musicians who can create original songs and therefore must use the songs created by other artists and composers. The difference between using and imitating, however, is taking the time to interpret those songs through the lens of your own congregation. Instead of imitating the worship style of other congregations, we should be trying to discover our own unique worship voice. Finding the voice of a congregation is not just following a recipe for the success of other artists and congregations. Sharing those events impacts the formation of the unique worship DNA of each congregation. So just imitating the worship voice of another congregation marginalizes those shared experiences for both the congregation who imitates and the one being imitated. If God has entrusted us with the worship position and people to which He has called us, then imitating or mimicking other worship contexts marginalizes that calling. So is that really what God intended for us and the best we have to offer Him and His church? Constance Cherry, in Terry W. York and C. David Bolin, The Voice of Our Congregation: Seeking and Celebrating God’s Song for Us (Nashville: Abingdon, 2005), 9. Terry W. York and C. David Bolin, The Voice of Our Congregation, 9. 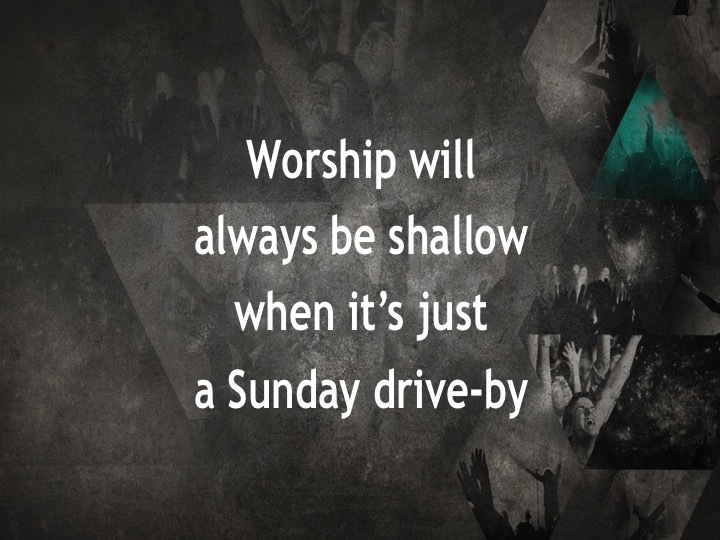 Sunday isn’t a day of rest for those of us with worship leading responsibilities. Some of us are probably wondering if we have enough in the tank to do it all again next week. So if Sunday isn’t our Sabbath, when is? Most worship team players and singers are volunteers with full-time jobs outside of their worship leading responsibilities. So they don’t have the freedom to take off the Monday after or Friday before Sunday like some of those in full-time ministry do. So if we don’t establish a regular rhythm of rotating players and singers in to allow them to catch their breath, then how can we expect them to lead others to a place they no longer have the spiritual, emotional or physical resolve to go themselves? Jesus said, “Come to me, all you who are weary and burdened, and I will give you rest. All of you take up my yoke and learn from me, because I am gentle and humble in heart, and you will find rest for yourselves. For my yoke is easy and my burden is light” (Matt 11:28-30). Offering permission for regular rhythms of rest means we are helping each other remove our self-made yokes. The word rest in this passage is better translated as refreshment. As a college student I worked a couple of summers installing aluminum siding, screen rooms and even an aluminum swimming pool enclosure. The pool enclosure was installed around and over a pre-existing pool that was full of water. Screws driven into the structure with powered screw guns held the aluminum joists and panels together. Inevitably some of the screws fell into the pool. So it was my job to dive into the pool several times each day to retrieve those screws so they wouldn’t clog up the pool filter and drain system. I certainly understood that word rest for a few minutes in the July Oklahoma heat. Jesus wasn’t challenging us to do something he didn’t practice himself. He said, “Learn from me” (Matt 11:29). After feeding the five thousand he perceived that the crowd would try to come and take him by force to make Him King. The text says Jesus withdrew again to the mountain by Himself to be alone (John 6:15). Indicating he had been there before. After John the Baptist was beheaded Jesus encouraged the disciples who had been working very hard and were grieving to “Come away by yourselves and rest for a while” (Mark 6:31). It is evident in chapter 12 of Matthew that Jesus is Lord of the Sabbath, we aren’t. Chapter 11 ends with him reminding us take his yoke because it is easy and his burden is light (Matt 11:29-30). A good yoke is formed to the shape of the neck of the oxen. It should cover a large area of skin to distribute the stresses widely. It is smooth, rounded and polished with no sharp edges so that no point will endure too much stress. When the yoke fits perfectly, the oxen can haul heavy loads for years and their skin will remain healthy, with no pressures sores. This text is a great reminder for us to lead worship with margins of recovery by bearing his yoke instead of those stressful burdens of our own making. Most of us couldn’t imagine leaving our children at a daycare that has stained carpet, musty odors, garage sale reject toys and old sound equipment stacked in the corner. But that is exactly what some churches offer to young parents and then wonder why they never return. The nursery and children’s areas should be the safest and cleanest rooms in the building. How can we expect parents to engage and understand meaningful worship at the same time they’re worried about the safety and health of their children? My ministry responsibilities often require me to regularly drive some of the same roads. So I’m pretty familiar with the rest stops along those routes. I know the ones I’ll stop at again and the ones I’ll never return to because they’re always filthy, never have the necessary supplies and have archaic or often broken plumbing fixtures. We don’t like to talk about the cleanliness of our restrooms at church but that is the last place many worshipers visit before we ask them to join us in singing the first worship song. We are often good at considering how to engage people during the services but don’t always think about worship distractions before and after those services. We assume the theological depth of our worship service will encourage visitors to return and even stay. And that might actually be true if they could ever see past our pre and post service blind spots. So in addition to evaluating sermons and songs, churches should also evaluate their worship spaces and structures. 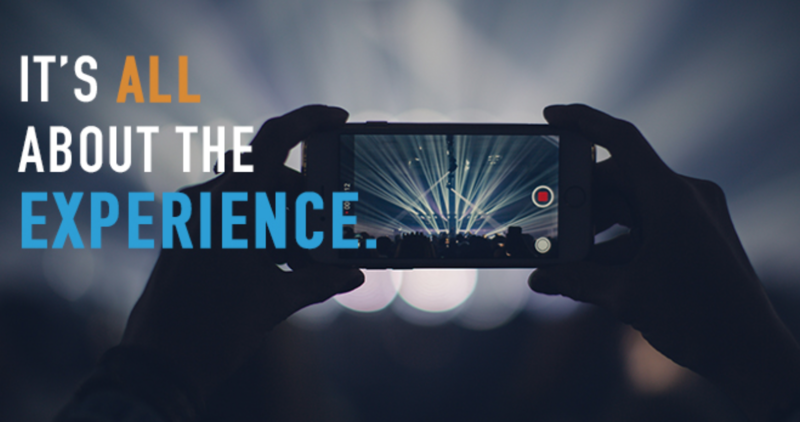 We’ve all heard the adage about only getting one shot at a first impression. Since it’s easy to overlook what we’ve gotten used to, it is helpful to secure an outside evaluator for a greater degree of unbiased and unprejudiced objectivity. Retailers and restaurants often enlist outside patrons or shoppers to collect information about their establishment. They evaluate things like the appearance of displays, friendliness and efficiency of the staff, cleanliness of restrooms, prices and the quality of their products. Churches could also learn a lot about themselves by enlisting a secret shopper. A friend from another congregation, an acquaintance from the community or even your favorite coffee shop barista could be enlisted as a secret shopper. For the minimal expense of presenting them with a restaurant gift card you could invite one or several guests to visit and complete an evaluation questionnaire like the one below. Considering the above items and others might seem inconsequential compared to understanding spirit and truth worship. But guests often visit with little or no understanding of theological worship. They do, however, understand excellence, cleanliness, the safety of their children and their own comfort or its absence. So isn’t it worth the effort to remove some of those initial distractions that could be keeping them from going deeper? Was it easy to get into the parking lot and convenient to park? Was it clear where you were supposed to go once you arrived? Was the property in good repair and grounds well kept? When were you first greeted, if ever? Did the attitude of the greeter make you feel welcome? Were you offered coffee and was it excellent, mediocre or bad? Were the foyer colors and decorations outdated? Did it seem like people were happy to be there and glad to be together? Were the handouts timely and of excellent quality? Was the restroom clean and odor free? Did you feel safe leaving your child in the children’s ministry area? Was the worship space interesting and pleasing to the eye? How did you figure out where to sit? Did you feel conspicuous when you entered the worship space? Was the worship center seating comfortable? Was the temperature at a comfortable level? Did anyone dress or look like you? How was the volume of the speaking and music? Did the leaders use language you didn’t understand? How was the service flow and pace? Did the service seem too long? Was the worship service order easy to follow or confusing? Was it easy to participate musically? Was the music presented with excellence? Was the music culturally relevant for the people present? Were the video projection elements presented with excellence? Did you feel welcome to participate in all worship service elements? Was the sermon easy to follow and meaningful? Did any of the service elements make you feel uncomfortable? Did anything in the service distract you? How did you know what to do when the worship service was over? Did anyone speak to you after the service? Were the members friendly, unfriendly or disinterested? Did the leaders seem approachable? Would you come back based on your observations? Some of us can imagine our worship services filled with people of multiple colors, nationalities, economic levels and political beliefs all worshiping God together. The problem with that scenario is that most of us imagine how great that vision would be as long as those various cultures, tribes and tongues are willing to make adjustments to worship like we do. Not in my style may really and truly mean not my kind of people, except when it comes time for the yearly youth group trip to Mexico. We are willing to go outside the church to diversify but failing miserably to do so within. So why are we so ready to defer when we travel around the world but not across town or even across the aisle? In chapter 7 of Revelation, the multitude of God’s people are standing before the throne of God sheltered by His presence. John’s vision of every tribe and tongue worshiping together as one is a heavenly prophecy of intercultural worship. 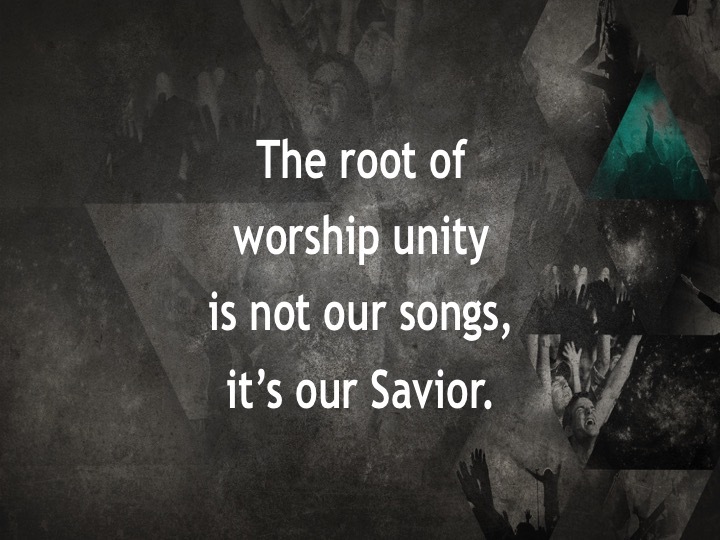 So if we aren’t meant to segregate as we worship in Heaven, then why are we so divided as we worship here on earth? Martin Luther King, Jr. famously said, “11:00 a.m. on Sunday morning is the most segregated hour in this nation.” Not much has changed since his original statement 50 years ago so maybe it’s time to try something beyond just adding a few ethnically diverse songs. We must stop trying to fix it with music. We believe music is a universal language just as long as everyone else lives in our universe. It’s impossible for intercultural worship to begin with a common musical style, so it must instead begin with a common biblical content. 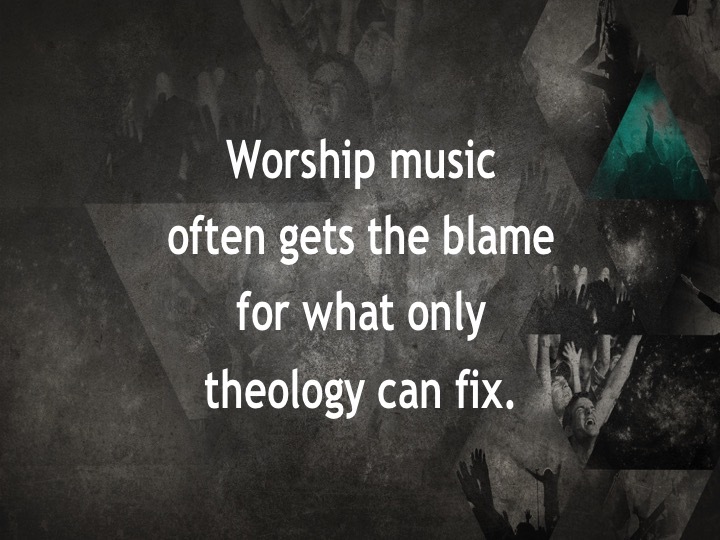 And when it does, music won’t get the blame for what only theology can fix. Ethnodoxologists encourage unity in the heart languages of those who are here and those who are not here…yet. Ethnodoxology looks beyond Americanism as having a corner on worship understanding and considers the vast work God is doing around the globe and across town. We must be mutually inconvenienced. Mitch Albom wrote, “Sometimes when you sacrifice something precious, you’re not really losing it. You’re just passing it on to someone else.” Our worship success will not be judged solely on how well we did it ourselves but also what conveniences we were willing to sacrifice as our spiritual act of worship so other tribes and tongues could do it too. We must stop living monocultural lives. Monoculture originated as an agricultural term that means the cultivation and growth of a single crop at a time. How can we expect to have intercultural worship on Sunday when we segregate monoculturally in everything else during the week? We must have intercultural platforms. We must become uncomfortable with injustice. Politicizing justice is the fear of losing control of something that was not ours to begin with, including the cultural preferences of our church. It is theologically incongruent to embrace cultural worship differences internationally while ignoring them domestically. American exceptionalism may be welcomed politically but it can’t be justified biblically. So worship that doesn’t act justly, love mercy and walk humbly by considering the voices of the marginalized is a worship God rejects. Harold Best, Unceasing Worship: Biblical Perspectives on Worship and the Arts (Downers Grove: InterVarsity, 2003), 181. If our church services give the impression that worship starts when we start it and ends when we end it; If all worship resources and energies are spent preparing for and presenting a single hour on Sunday; If we aren’t exhorting our congregation and modeling for them how to worship not only when they gather but also when they leave; Then we are enabling mindless worshipers. Jesus’ greatest commandment was to love God with all our heart, soul, mind, and strength and also love our neighbor as ourselves (Mark 12:30-31). Paul’s exhortation to the church at Philippi was whatever is true, whatever is noble, whatever is right, whatever is pure, whatever is lovely, whatever is admirable – if anything is excellent or praiseworthy or worth our worship…we should think about such things (Phil 4:8). Worshiping with our minds allows us to approach worship with knowledge, insight, reason, memory, creativity, inquiry, imagination and even doubt. So if we offer our prayers superficially; if we read and listen to Scripture texts mindlessly; if we gather at the Lord’s Supper Table hastily; and if we only sing our songs emotionally; the end result is often mindless worship. We could learn a lot from the Jews who believe the Sabbath begins at sundown. Then the activities and things with which we fill our minds the night before we gather could better frame our worship attitudes on the Sabbath. My daughter was five years old the first time our family vacationed at Disney World. After months of planning and days of travel, the final preparations for and anticipation of the first day at Magic Kingdom was almost too much excitement for her to contain. Like a firefighter, she selected and laid out her clothes the night before so she could jump into them the next morning. Sleep eluded her with the anticipation of what was to come. She awakened early, quickly dressed and inhaled breakfast so she would be ready to depart hours before the park even opened. All conversation traveling from our resort to the park entrance centered on what she would observe, experience, eat, participate in, enjoy and then take home at the end of the day. She had been thinking about it, dreaming of it, planning, preparing and longing for it. Her mind was so filled with it she couldn’t contain the anticipation. Empowering instead of enabling worshipers encourages them to think, behave or take action autonomously. It gives them the permission to take ownership in their own worship responses to God’s revelation at the moment in which it occurs. Worship empowerment arises from the shallowness of dependency and leads to the full conscious, active and continuous participation of each worshiper. 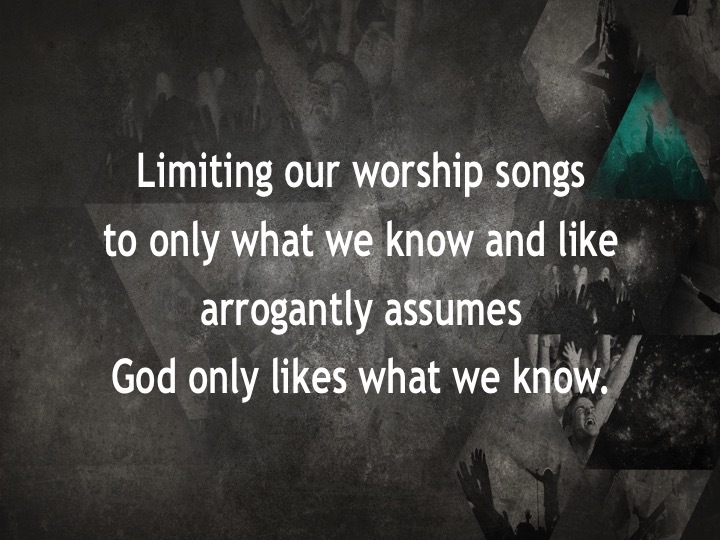 Worship that doesn’t require us to think is superficial. Worship or love of God and others must be continuous or it becomes self-serving. And it can’t be continuous unless we think about it, consider it, process it, meditate on it, study it and learn how to get better at it in order to better teach others how to do it. So until we move beyond just waiting for the song set to enable us to worship, we’ll never encourage deep calling unto deep worship that also engages our minds. Annie Dillard, Teaching A Stone to Talk (New York: Harper Perennial, 2008), 52. Music is an expression given to us so that we might offer it to God in worship. But it isn’t the only expression. 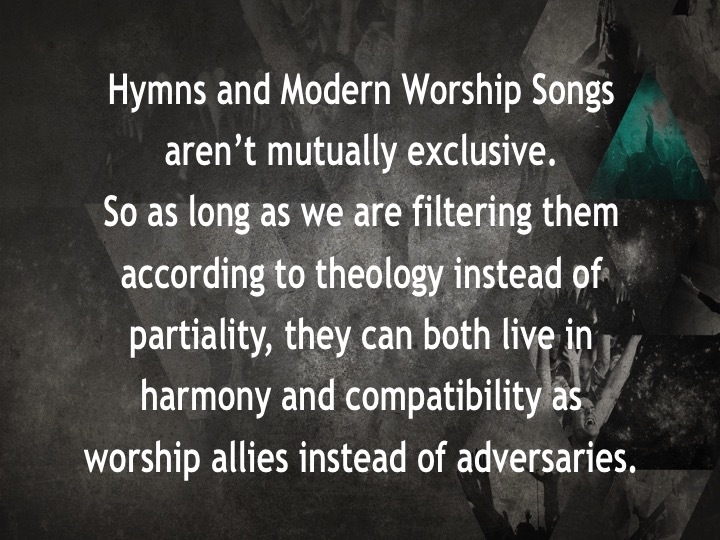 So why do most worship conversations continue to circle back to a binary discussion of hymns and modern worship songs only? Just considering those two worship options means we’re satisfied with our congregation swimming in the shallow end of the pool. We must, instead, be willing to educate, enlighten, and coax them into the deep end. 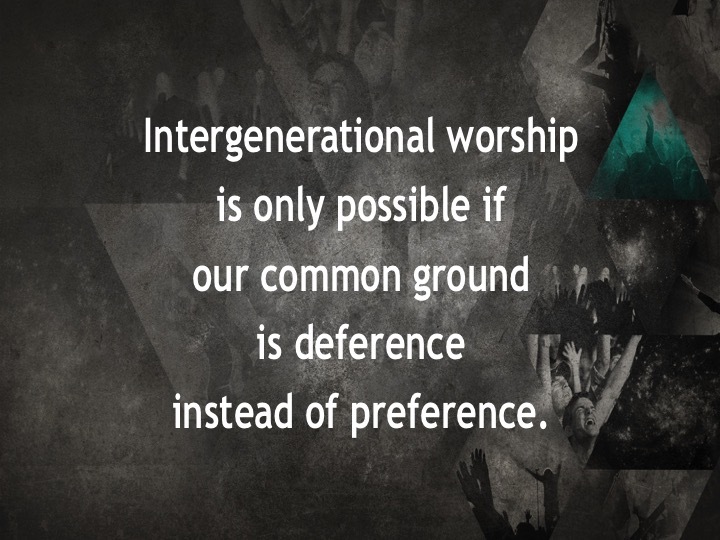 Worship is vertical, horizontal, meditative, reflective, sacrificial, celebrative, scriptural, prayerful, intergenerational, intercultural, global, local, personal, and corporate. It’s theological, visual, tactile, iconic, aural, verbal, instrumental, artistic, dramatic, aesthetic, imaginative, spontaneous, painted, danced, quoted, recited, sculpted, read, dressed up, dressed down, scripted, printed, and filmed. It emotes through confession, invocation, supplication, intercession, meditation, celebration, lament, thanksgiving, anger, sadness, contemplation, joy, grief, despair, hope, pain, amazement, surprise, happiness, sorrow, shame, regret, hurt, peace, relief, satisfaction, fear, and love. It remembers symbolically and sacramentally as an ordinance or rite through Communion, Lord’s Supper, The Eucharist, and Baptism. Its prayers are fixed and spontaneous. It remembers the past, impacts the present, and challenges the future. It serves by doing justice, loving mercy, and walking humbly. It includes the Father, Son, and Holy Spirit. It gathers, exhorts, preaches, teaches, blesses, dismisses, and sends out. It is continuous. And it also plays and sings psalms, hymns, and spiritual songs. If we are to expand our worship vocabulary it means every worship leader must become the lead mentor and lead shepherd, living a life in quest of the full richness of artistic action. The art of our worship must point beyond itself. It must freely and strongly say, “There is more, far more.” Be hungry. Be thirsty. Be curious. Be unsatisfied. Go deep. Harold M. Best, “Authentic Worship and Artistic Action,” an address to the Calvin Institute of Worship, 2005. Right notes are always more important than right relationships. 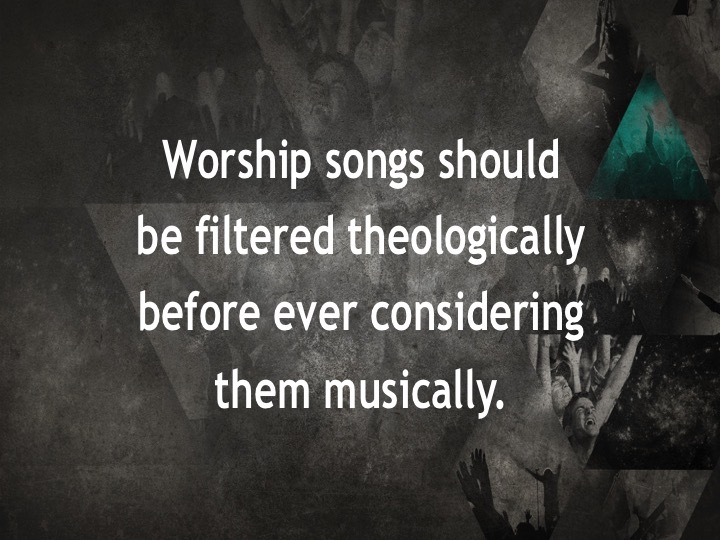 Song choices are always considered musically before they’re filtered theologically. You’re attempting to grow your church just by changing the music. Music has taken the place of prayer as your primary worship service conversation with God. Congregants give music all the credit for either causing or curing worship conflict. You’ve sanctified a favorite musical style or genre. Music is foundational but Communion is supplemental. Scripture readings are shortened so the song set can be lengthened. 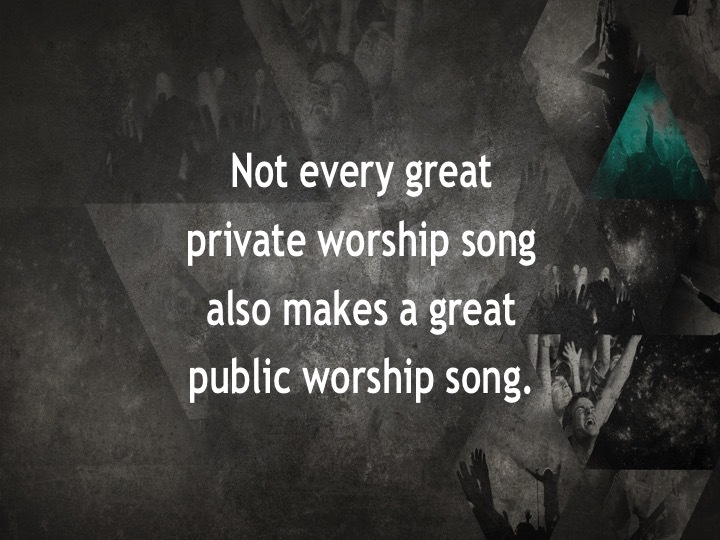 Worship is exclusively synonymous with music. 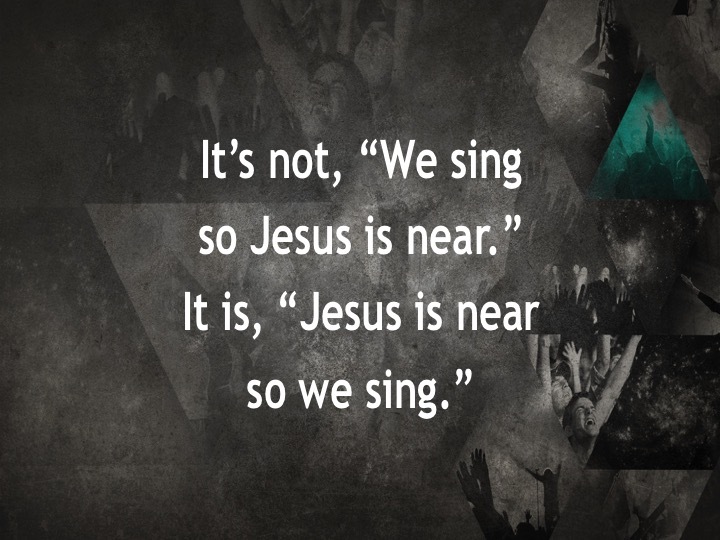 You’re convinced how or what you sing determines if God shows up. The point is not to completely understand God but to worship Him. Let the very fact that you cannot know Him fully lead you to praise Him for His infiniteness and grandeur. Can you worship a God who isn’t obligated to explain His actions to you? Could it be your arrogance that makes you think God owes you an explanation? Many Spirit-filled authors have exhausted the thesaurus in order to describe God with the glory He deserves. His perfect holiness, by definition, assures us that our words can’t contain Him. Isn’t it a comfort to worship a God we cannot exaggerate? I sometimes struggle with how to properly respond to God’s magnitude in a world bent on ignoring or merely tolerating Him. But know this: God will not be tolerated. He instructs us to worship and fear Him. No worship is better than apathetic worship. Multi-tasking is keeping me from whole-hearted worship. If one person “wastes” away his day by spending hours connecting with God, and the other person believes he is too busy or has better things to do than worship the Creator and Sustainer, who is the crazy one? Before you say one word to God, take a minute and imagine what it would be like to stand before His throne as you pray. When I experience the power of God, why do I do anything other than pray? The wise man comes to God without saying a word and stands in awe of Him. We forget that God never had an identity crisis. He knows that He’s great and deserves to be the center of our lives. The point of your life is to point to Him. Whatever you are doing, God wants to be glorified, because this whole thing is His. Are we in love with God or just His stuff? By catering our worship to the worshipers and not to the Object of our worship, I fear we have created human-centered churches. Congregations tend to plan and implement in the moment since Sunday comes every. single. week. So thinking about finding future players, singers, or even a primary worship leader is rarely a consideration…until a vacancy occurs. Player development is what Major League Baseball calls the grooming of younger, less advanced players in their minor league system. The so-called farm teams provide mentoring, training, coaching, and practical experience for younger players with the expectation that as a player matures he will advance to a higher level of play and responsibility. The genius of the farm system is that players get better by playing regularly in smaller venues instead of just waiting for an opening to play in the major leagues. So they are intentionally investing in younger players for the future of the team. A major league team with a weak farm system may have success for a time but will rarely carry that success into the future. The value of worship player development is realized when a congregation attempts to fill a vacancy. What most find is that the pool of potential replacements out there is often very shallow. Those who are available are often unknown and don’t always resonate with the culture of the searching congregation. Implementing a farm team model of developing younger, less advanced players from in here can offer a trusted and familiar resource pool for future players, singers, or primary leaders. And investing in those who already understand the culture, personality, worship language, and mission of your church has a greater potential for future success. 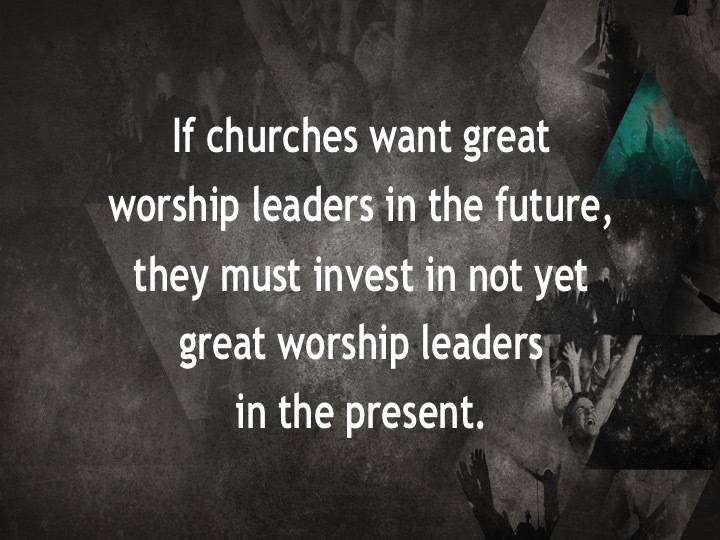 If churches want great worship leaders in the future, they must invest in not yet great worship leaders in the present. 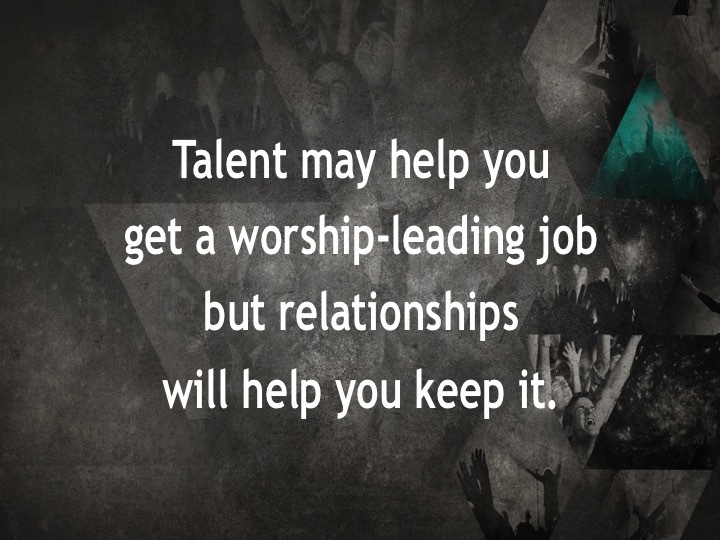 Imagine then, one of those congregations so effectively implementing this player development model that they are able to groom more worship leaders than they have places for them to serve. Then, imagine the Kingdom value of that congregation getting to farm-out those trained leaders to other congregations who were not as prepared to fill their own vacancies. 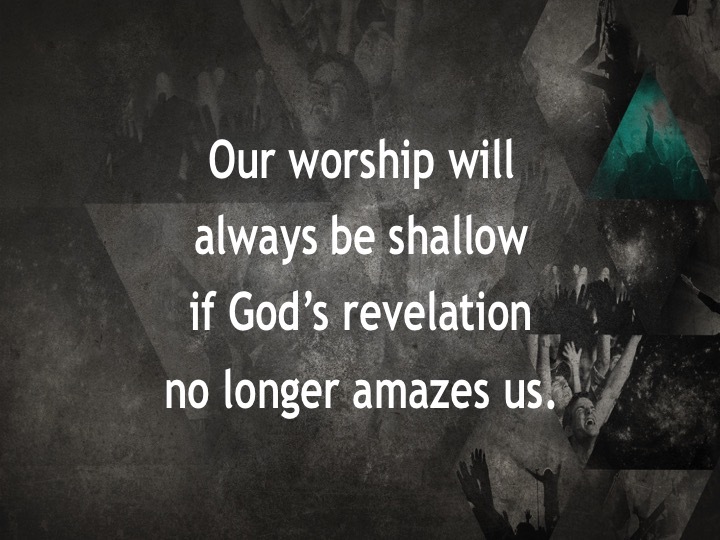 Our worship will always be shallow if God’s revelation no longer amazes us. 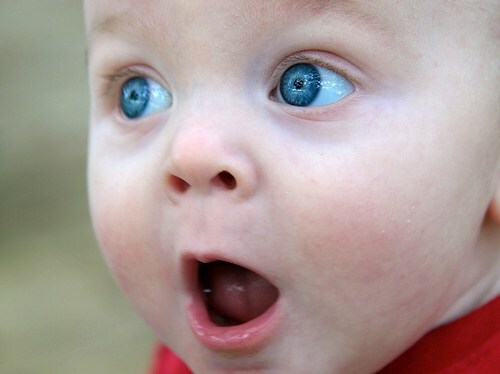 It should cause us to be fascinated, surprised, curious and captivated. But, in reality, it rarely awes or fills us with wonder. When we are no longer amazed we are left with dry and dead religion; when we remove mystery we are left with frozen or petrified dogma; when we script awe we are left with an impotent deity; and when we abandon astonishment we are left with shallow worship. 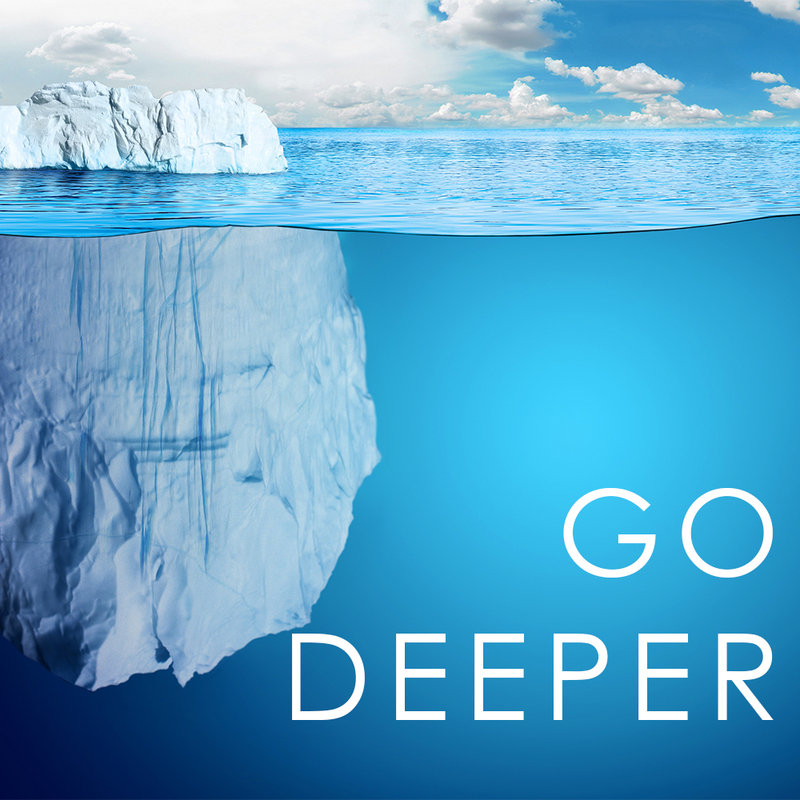 So how much deeper could our earthly worship go if we responded as if experiencing God for the first or last time? When we aren’t looking His holiness might just break through like a rainbow. God is transcendent. He is beyond, above, other than and distinct from all. So as the heavens are higher than the earth, so are His ways higher than our ways and His thoughts higher than our thoughts. If that understanding alone doesn’t cause us to worship with wide-eyed wonder, then no songs or sermons ever will. lost in wonder, love and praise. A.W. Tozer, The Knowledge of the Holy (New York: Harper Collins, 1961), 18. Adapted from Michael Yaconelli, Dangerous Wonder: The Adventure of Childlike Faith (Colorado Springs: NavPress, 1998), 23-28. Adapted from a quote by Madeleine L’Engle. Is Our Worship Wasting God’s Time? Our English language has only one word for time. But the ancient Greeks used two different words to distinguish between chronological time and theological time. Chronos is sequential time that is orderly, rhythmic and predictable. It is time that is externally controlled, can be measured by a clock and is quantitative. Kairos is the time not measured by the clock, but the moment God has chosen. It is time that could disrupt the normal flow of tradition, habits, methods and ways of thinking. Kairos is qualitative and cannot be humanly manipulated or controlled. 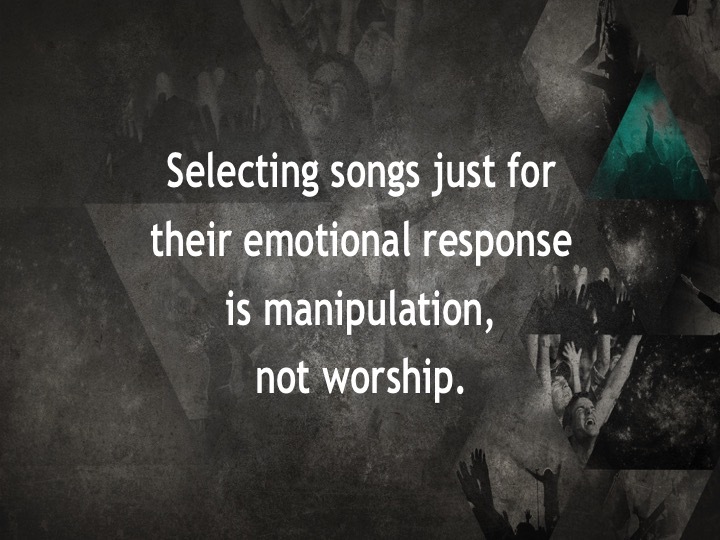 We can’t create theological time or God moments through our song selections, emotions or orders of worship. That holy time doesn’t originate from our own innovations, desire for relevance or by following a recipe for worship success observed in other churches. The writer of the book of Ecclesiastes understood Kairos time when he wrote, “For everything there is a season, and a time for every matter under heaven… a time to weep, and a time to laugh; a time to mourn, and a time to dance” (Ecclesiastes 3:1,4). When Jesus’ brothers failed to understand who he was, he tells them, “My time (Kairos) has not yet arrived, but your time (Kairos) is always at hand” (John 7:6). Kairos time is the moment of undetermined length in which the eternal (God and His story) breaks into the temporal (me and my story), shattering and transforming it, and prepares the temporal to receive the eternal. It is in this moment in which the conditional cancels itself out and makes itself the instrument of the unconditional. In a Chronos approach to worship, a congregation asks God to enter its story or the story of its own making. In a Kairos approach, the congregation is asked to enter God’s story. Kairos might occur in the former but has already occurred in the latter. So here is a question we should ask as we plan and lead worship each week: “Are we missing Kairos moments in our efforts to manufacture creative worship services?” God has provided Scripture, prayer and the Lord’s Supper as Kairos opportunities for us to join His story. So in our creativity and innovation are we minimizing His time (Kairos) in order to give more time (Chronos) to other service elements of our own making? adapted from Fr. Ken Kulinski, “Kairos-God’s Time.” CowPi Journal, 9 October 2003. Database on-line. Available from http://cowpi.com/journal/2003/10/kairos_gods_time.html. 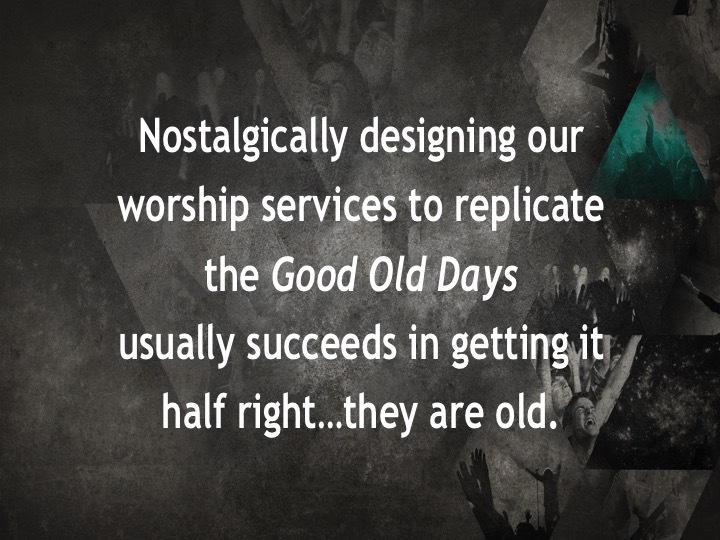 Congregations are constantly trying to discover and create good worship. So they’ve expanded their song catalogs and adjusted their presentation methods in an effort to find a formula that accomplishes that goal. Some just bypass the heavy lifting altogether by imitating the worship practices of other congregations and call it good. The minor prophet Micah faced similar challenges as he responded to the shallow worship practices evident in the lives of the religious leaders of his day. He vigorously condemned the dishonest, corrupt and meaningless worship prevalent in Judah and Israel. According to Micah, outward appearances indicated they thought their worship was good. But their worship character wasn’t consistent with what God calls good. So Micah wrote, “He has shown you, O mortal, what is good. And what does the Lord require of you? To act justly and to love mercy and to walk humbly with your God” (Micah 6:8). If someone says, “I love God, (an act worship) and hates his brother, (also an act of worship) he is a liar” (1 John 4:20a). Worship that acts justly realizes loving God with all my heart, soul, mind and strength is incomplete until I also love my neighbor as I love myself (Luke 10:27). Mercy is the willingness to sacrifice ones own interests for the greater worshiping good of the congregation. Merciful worship begins by surrendering or sacrificing for the sake of something or someone else. It is the act of giving up, offering up or letting go. King David understood merciful worship as he responded to God’s command to build an altar so the plague on the people of Israel might be stopped (2 Sam 24:21). At no cost to David, Araunah offered his threshing floor, his oxen and even the wood from the oxen yokes for the burnt offering. 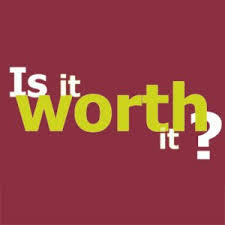 The king replied, “No, but I will surely buy it from you for a price, for I will not offer burnt offerings to the Lord my God which cost me nothing” (2 Sam 24:24). We often take credit for instigating God’s presence by what we sing and how we sing it and call that good worship. In reality, God started the conversation, was present long before we arrived and has been waiting patiently for us to acknowledge Him. He has called us out of darkness into His marvelous light that we may declare His praises (1 Peter 2:9). The Father seeks the kind of worshipers who worship in spirit and truth (John 4:23). Mark Labberton, The Dangerous Act of Worship: Living God’s Call to Justice (Downer’s Grove: InterVarsity, 2007), 22-23. Eugene Peterson was a pastor, scholar, author and poet. On October 22, he finished his Long Obedience in the Same Direction. He left an indelible mark on various areas of Christian thought, including the following on worship. Worship is the strategy by which we interrupt our preoccupation with ourselves and attend to the presence of God. Christians don’t simply learn or study or use Scripture; we assimilate it, take it into our lives in such a way that it gets metabolized into acts of love, cups of cold water, missions into all the world, healing and evangelism and justice in Jesus’ name, hands raised in adoration of the Father, feet washed in company with the Son. Worship does not satisfy our hunger for God; it whets our appetite. Feelings are great liars. If Christians worshiped only when they felt like it, there would be precious little worship. We think that if we don’t feel something there can be no authenticity in doing it. But the wisdom of God says something different: that we can act ourselves into a new way of feeling much quicker than we can feel ourselves into a new way of acting. Every call to worship is a call into the real world. The most important thing a pastor does is stand in a pulpit every Sunday and say, “Let us worship God.” If that ceases to be the primary thing I do in terms of my energy, my imagination, and the way I structure my life, then I no longer function as a pastor. I cannot fail to call the congregation to worship God, to listen to his Word, to offer themselves to God. It’s essential for us to develop an imagination that is participatory. Art is the primary way in which this happens. It’s the primary way in which we become what we see or hear. A Christian congregation is a company of praying men and women who gather, usually on Sundays, for worship, who then go into the world as salt and light. God’s Holy Spirit calls and forms this people. God means to do something with us, and he means to do it in community. We are in on what God is doing, and we are in on it together. 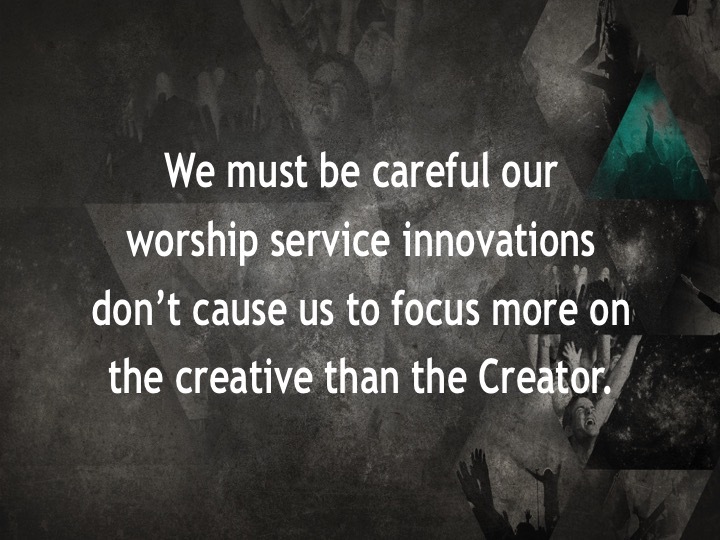 Most worship leaders love using their creativity to lead worship. Creativity, however, can be a smoke screen for laziness. Sometimes a love for leading can be feckless, meaning it lacks the strength of character to move beyond creativity to hard work. Feckless worship leaders love leading worship musically but don’t have the resolve to do the heavy lifting biblically, theologically, relationally and even physically. Consequently, they depend solely on their love for playing and singing on the platform and disregard diligence off the platform. Wilson Mizner said, “Work, work, work…the gent who wakes up and finds himself a success hasn’t been asleep.” So your love for leading may help you get that worship job but hard work is going to help you keep it. They spend more time searching files for previously used worship service orders than it would have taken them to create a new one. Their song sets are determined exclusively by scanning CCLI’s Top 100, What’s Hot on Praise Charts or the Hymnal. They aren’t willing to communicate in newer and older languages of chord charts and choir scores or hymns and modern songs even when the culture of their congregation calls for it. They spend Monday through Thursday pondering their creativity but then have to scramble on Friday morning to actually harness it into a worship service for Sunday. They imitate the worship sounds, habits, methods, styles, presentations and even attire of other artists or congregations without considering the unique voice of their own congregation. 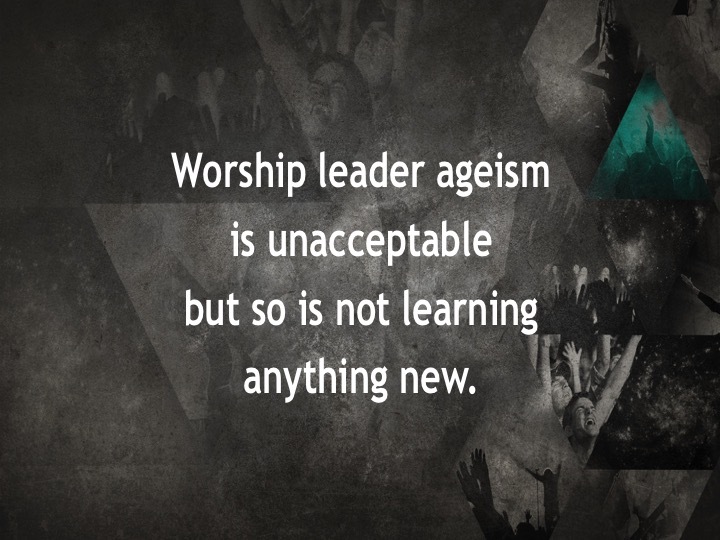 They don’t see the need to attend conferences, read books, take additional lessons or dialogue with other worship leaders. They don’t take the time to invest in the lives and ministries of younger leaders or train those who will come behind them.